Due to the loss of a very good friend of mine,I am taking a break from the usual format. I may be back sometime to get my thoughts down about this incredible loss to his family,which is first and foremost,and mine as well. When you lose a special person in your life, the trades of Dave Littlefield and the general antics of Will Smith and the Suns seem so minute. I could be back in a few hours or a few days,Just wanted to let everyone know. Suns still working on the discovery of a TARP!! The Hagerstown Suns game tonight vs the Augusta Greenjackets was called off due to unplayable field conditions. Apparently the Suns are not smart enough to realize that you put a tarp on the field for protection from the weather when the field is not in use. Most LITTLE LEAGUE fields and volunteers have figured this out long ago,but a "professional" baseball club apparently cannot. Of course,it is likely that the Suns front office was too busy counting the plungers for their upcoming promotion. It takes a few minutes to put a tarp down and I don't care that the weather projections for rain have often times been incorrect. Putting a tarp down is simple common sense. This is a fiasco beyond belief,as the Augusta players were laughing at the ridiculousness of this evening. Not to mention that this was another feed your face night. Normally a team would at least try to make the field playable,as they could sell concessions as they attempted repair. But since this was FYF night,it made more sense to this staff to call the game WITHOUT any effort,as the time taken to make the effort was food that was given away during the delay. Not to mention the immediate closing of all food stands to avoid having to give any further food away. You did get a free ticket for another game,BUT if you paid to attend this game and paid the extra dollars for FYF night,you take a 2-4 dollar loss per ticket. people I heard as I left the stadium,most were far from impressed and certainly were less than likely to return for a while. What will it take for these guys to get the hint that whatever one would call their "management style" that it is proving to be ineffective,not fan-friendly at all and incompetent. How many times can this organization blow layups before the game ends in failure? But as long as nights like tonight are shrugged off as other peoples problems,corrections cannot be made and when you ignore mistakes and pray they go away-nothing happens besides a massive piled up mess. I do not wish bad things on people,everyone has to work and make a living. But it has become abundantly clear that the front office here in the Hub City needs to be swept out and started over. Lots of trades today including former Suns catcher (and Rachel's favorite player)Drew Butera moving from the Mets organization to the Twins for Luis Castillo. I will likely do a big trade deadline review tomorrow. Sorry to hear about the death of Tom Snyder from Leukemia. I,being a night owl,always enjoyed both the Tomorrow show as a kid and the Late Late show as an adult. Terrific interviewer and offered the late night viewer some intellectual fare beyond the usual norm. So to Tom,here's one last one-"Fire up a colortini, sit back, relax, and watch the pictures, now, as they fly through the air." Took advantage of the fiasco tonight and got some Augusta players outside t he stadium. This is not a team loaded with prospects,but I was able to get one of the two higher rated prospects in Emanuel Buriss. Also got 2 cards from Greenjackets manager and former MLB outfielder Roberto Kelly signed. Thanks to Jeff Heimberger for helping with Kelly and others tonight. But former big league pitcher Ross Grimsley signed all 10 cards that I had and talked as well. Still have about 10 Greenjackets to finish up on before they leave town and the Greenville Drive comes in. I will see 3 of the 4 games for Greenville,as the other night,I will be in Frederick to see the Potomac Nationals. Hopefully I can finish up on the Suns players that were called up to Potomac in the Nationals version of Nixon's "Midnight Massacre". Back tomorrow with more on the signing front,MLB trades and yet another attempt at the post I have been meaning to write. The Phillies completed their sweep of the Pirates today in Philly with a 5-1 win. Saturday,The Pirates lost a early lead and lost 10-5. I don't have too much to say on that game,as my power went out when the Bucs had the lead and came back on after 8 Phillie runs. Shane Youman had most of the shellacking and therefore picked up the loss that dropped him to 2-3. Today's game was pitiful in a different way. Ronny Paulino gave the Phillies 1 run with a horrendously poor effort on a Ian Snell pitch,that was amazingly scored a wild pitch. 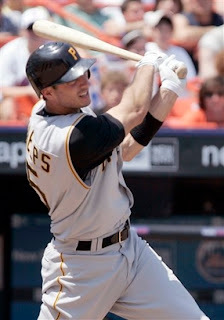 In the Pittsburgh 9th,Xavier Nady stood at second instead of tagging up on a long fly ball by Jose Castillo. I know the score is 5-1,but weirder things have happened. Ian Snell allowed 3 runs over 6 innings and was the loser and fell to 7-9 on the year. Not a great outing,but his best since the all-star break. Nate McLouth hit a solo homer (3rd) for the only Pirate run. After yesterday's post,John Van Benschoten was demoted to AAA Indianapolis and Jonah Bayliss was recalled to join the bullpen. Why did the bullpen need additions? Because Tony Armas was placed back into the rotation! Please,anyone tell me what Tony Armas has done to given this chance???? This season is over,pick someone else from Indianapolis to take a look at. 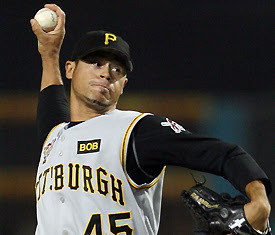 We know what Tony Armas will give the Pirates and he is gone at season's end anyway. Why not see what someone else might be able to do? For the record,I disagree with the demotion of JVB. Not for the record that he compiled,that is worthy of demotion. I think after the hype given to the "reworking" of his mechanics with the noted "rebuilder" Jim Colborn,to give him just 1 start is pretty weak and borderline unfair. The Pirates return home Tuesday for a series vs the Cardinals. Kyle Kendrick was the winning pitcher for the Phillies today over Pittsburgh and improved his record to 5-1. Kyle signed for us last year when he was a Lakewood Blue Claw and seemed like a pretty good guy. Speaking of nice guys,Good luck to former Brown Tim Couch. Couch is attempting a comeback and signed a two year contract with the Jaguars. I am not convinced that Couch would have ever been a franchise QB in Cleveland,but I don't think anyone could have been,if they were depending on some of the Browns offensive lines during that time period for protection. Former Pirate Bill Robinson died today at 64. Robinson was working for the Dodgers as a minor league instructor and is most noted to Pirate fans for his solid run as a Pirate in the late 70's with 3 20+ homer seasons and a 100 RBI season as well. Robinson was also a Pittsburgh native. The Astros designated Morgan Ensberg for assignment. This is the type of player that Pittsburgh needs to take a chance on. The cost will be minimal and the rewards could be huge. Just two years ago,Ensberg hit 36 homers and knocked over one hundred runs. He has struggled since a shoulder injury,but still well worth a flyer. Steven Pearce was promoted to AAA Indianapolis today from AA Altoona. This is a smart move by the Pirates and gives Pearce a months worth of AAA pitching to give him more of a chance to prepare for a possible bid for the big roster in spring training. Glad that I was able to get his cards signed last week at Altoona! Back tomorrow with the promised post that was supposed to be done over the weekend. Phils flatten Bucs in the rain. John Van Benschoten pitched poorly,the Phils made him pay and won going away 8-1 in a rain-shortened seven innings. I cannot add much to this performance ,but the Jim Colborn "adjustments"did not seem to do much for JVB,who seems to be in danger of losing his rotation spot. Walks and getting behind in the count are killing him and the fat pitches that result are being hammered. Very little else I can add to this one. The Hamilton Tiger-Cats were dropped to 0-5 after a 36-18 loss in Winnipeg to the Blue Bombers. Game was not televised,so I have no thoughts on the game other than what I read. Milt Stegall of Winnipeg set the CFL record for touchdowns in the Bombers win. Here is two more links to thoughts on the passing of Skip Prosser. Joe Thomas at tackle and Eric Wright at corner play the two toughest positions for rookies in the NFL and needed to be in camp for the full duration. Kudos to the Browns for getting the deals done. Here is a quick rundown of the trip to Altoona. Ryan has not loaded pictures yet,so I will post them whenever he gets around to it. The game vs the Binghamton Mets was kinda uneventful-a 7-2 Mets win,with the exception of a 5 run Met 4th. The Curve finished with more hits,but never seem to string them together. Jason Delaney hit his 7th HR as a member of the Curve,Delaney has moved himself from an organizational guy to a prospect this year with his performance in Lynchburg and then in his promotion to Altoona. Neil Walker had 2 hits and Andrew McCutchen had another ofer. It is clear that McCutchen was moved too fast this year and may have hindered his development a bit. I will not criticize for this as I agreed at the time with the decision,but with hindsight,it was not a good move. If you get the chance to see Blair County Ballpark,do so. 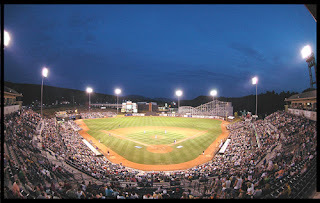 It is a beautiful little ballpark and for the most part,the Curve employees do a great job. Battlin Bob had problems with 1,but other than that guy.I think they do a terrific job. I cannot imagine a better AA park to watch a game with the open hillside beyond left field and the roller coaster from nearby Lakemont Park over the fence in right,it is very scenic and somewhat different. Now the downside to BCB and it is a tale that I hear often from autograph collectors-the newer ballparks just do not give you much access. You have to get there early and get position by the line roughly around the base spot leading to the outfield and even then it is not great. I had a little more success this year than last year,but still not enough to give my endorsement to BCB as an easy place to get signatures. I did the Curve team,accompanied by Battlin Bob,while Ryan did the Binghamton side. Maybe I can get Ryan to do a guest post on his side dealing with Mark Kiger and the Mets. He did get me some cards from the Binghamton side. I was able to get 8 Curve players to sign and with the exception of Neil Walker-I was able to get all the "main" players that I wanted. I bought a Curve and Eastern League prospects set and tried to pull the players that I wanted most and tossed the rest in my briefcase for later use,through the mail for the guys that might play Arizona or Hawaii fall league. We have had some success from those last year and actually got Neil Walker to sign that way. So with only a few cards that I brought with me,I didn't have a large stack of cards to go through. The biggest catch was Andrew McCutchen,as he signed all 4 cards that I had-his 06 Hickory update,Curve card along with 2 EL prospects. As in Hickory,Andrew doesn't have too much to say,but signs. Steven Pearce signed his Curve card and 2 Lynchburg cards and was the most personable signer,as he chatted for a few minutes. Jason Delaney signed his 2 Hillcat cards and was reasonably friendly,as was Wardell Starling. Starling always seems to be in a good mood and laughed as we talked briefly. Wardell signed last year and was in a paperwork move on that day,being assigned to Hickory for the day. I told him that and he responded "I'll go back and play legion ball before I go back to Hickory". Other signers were Cuban defector Yoslan Herrera (2),Romulo Sanchez (2),Matt Peterson and manager Tim Leiper. Neil Walker signed for others,but we just couldn't get into the right position for him to sign. Twice,we hollered for him,but he was in a rush with things to do and after the second time.he said"I'll get you after the game". When Battlin Bob tried,a Curve employee refused to let Bob through,even as Bob told this guy that Walker said "after the game". No dice.The only downer to a fun day at the ballpark. I did get to speak briefly after the game with Mets (and former Hagerstown Sun) pitcher Bobby Parnell after the game. Bobby was working the radar gun and I said hello and swapped small talk for a minute after the game. If you are going to see a game at a super ballpark,I recommend Altoona highly. If you are going for the autograph side,my advice is this. Be prepared with who you want most,don't bring cards you don't need and get there early. Skip Prosser dead at 56. I know that I promised a post on the Altoona trip,but that will wait u ntil tomorrow. My favorite current college basketball coach,Skip Prosser of Wake Forest is dead at the age of 56 after collapsing after a jog on the Wake Forest campus. Prosser was formerly the coach at Xavier(another favorite) and left to become the head man at Wake. Skip's record over his career at Loyola.MD,Xavier and Wake Forest was a stellar 291-146 and only 2 losing seasons. Last year Wake Forest was 15-16,despite a predominately underclassman based squad. 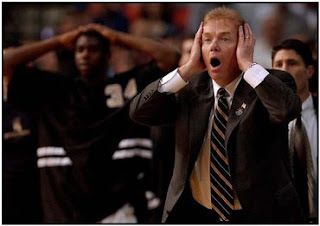 I had began to root for Wake from the day Skip was hired ,as I was such a fan of his during his tenure at Xavier. Skip took what Pete Gillen had begun at Xavier and built on it to the point that Xavier became an Atlantic 10 member under his guidance. The Atlantic 10 was certainly a move up the conference ladder from Xavier's previous league -the MCC. Prosser took over from Dave Odom at Wake Forest and won 20 games in each of his 1st 4 seasons there before falling to 17- 17 . That was mainly caused by over-scheduling,as Chris Paul was not expected to be an early entry into the NBA that season and when he did so,Wake Forest had a brutal non-conference schedule and less than expected talent. Skip Prosser gone too soon at the age of 56. The Pirates rallied against Oliver Perez in the 6th to earn an 8-4 and avoid a sweep in the Big Apple (or the Big Cesspool,as Wes Huntley called it). The Mets led 1-0 in the sixth,when two hits by Nate McLouth and Paul M aholm followed by a Perez throwing error produced 1 run. Xavier Nady then singled to bring two more home and then the forgotten Josh Phelps,getting a rare start smashed his 1st home run as a Pirate (3rd overall) to complete a 5 run inning. Phelps was in the lineup at first base,so Adam LaRoche could get a day off against a tough lefthander. Phelps would add two more on a 7th inning double to complete the Pirate scoring for a 5 RBI day! The other Pirate RBI belonged to Jason Bay. Another solid outing by Paul Maholm,3 runs and 6 hits in 6.0 innings and moved his record to a increasingly less hideous 7-12. Damaso Marte,B.P.Chacon and Matt Capps each pitched an inning to finish up. The Bucs travel to Philadelphia tomorrow for a weekend series vs the hated Phillies. Back later tonight or tomorrow with Altoona and more. I just wanted to get the Skip Prosser news up ASAP. This one deals with the Pirates and some bullpen notes and later I will talk about the trip to Altoona and hopefully post a pic or two. The Pirates lost yet again to the Mets 6-3,falling to a stellar 1-10 since the All-Star break,but the worrisome news is Tom Gorzelanny's exit from the game due to "Stiffness" in his shoulder after just 2 and 1/3 innings of work. Gorzelanny and Jim Tracy seemed to downplay it after the game,but considering this organization's track record with pitching injuries,it is only natural to be concerned. Gorzo was not having a great game any way,as he allowed 3 runs in the 1st inning and 3 more before being removed in the 3rd. Jason Bay homered for the second night in a row (16) and seems to finally be busting out of a brutal long term slump. Adam LaRoche added the other RBI. The San Diego Padres made out like bandits today as they swapped reliever Scott Linebrink to Milwaukee for 3 minor league pitchers,one of which was former West Virginia Power righty Will Inman. I saw Inman last year and came away quite impressed with his feel for pitching. But before you get too excited,remember the Littlefield Line. "Low Ceiling Major League ready". Sorry to have to burst any bubbles,but until he does differently,we have to grade by the record. The brother of Adam could step right in and start,but would make a difficult decision on Neil Walker staying at the Hot Corner. The above link also shows that Ian Snell's wanting to win apparently isn't taken too seriously in the Pittsburgh clubhouse. 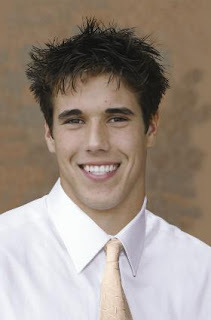 Nice to see Browns Bust (projected) Brady Quinn is doing so well while holding out. His recent charge of 75 bucks to sign a picture at a Cleveland mall makes me glad that I stick to baseball autographs! In other Quinn news,his holdout looks like a long and protracted one. He is asking far more than he is worth,but I understand this. Did I mention how much I hate Charlie Weis for his relentless hype job on Quinn?? Arkansas State is dropping the Indians name from their sports teams. A while back they dropped the familiar Runnin Joe mascot for Red. Red was this silly looking Nick for kids looking guy. It is too bad,when the NCAA passed this rule on Tribal nicknames-the clock was ticking. On the topic of Arkansas State. Note to Arkansas play them once in a while! Finally,one of our pitchers that we follow here-Eric Krebs of Hickory, returned to the Crawdads last night for the first time since a May injury. You can read about it from our neighbors at Crawdad blog. All for now,later today a post on Altoona and coming up over the next few days will be a quick look at how some of the pitchers we follow here are doing and maybe the controversial post I have written yet and it does not involve Captain Dave or Will Smith! Quick post today,as I will be watching the Altoona Curve battle the Binghamton Mets in a few hours. 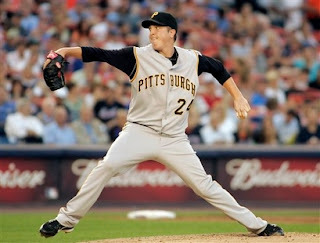 The Pirates lost in New York to the Mets 8-4,but the bigger story was another post-game outburst by Ian Snell. Snell was knocked out after just 4 innings and has not pitched well in his post-All Star game starts,but between rumors about a possible trade,the constant losing and the seemingly non-chalant attitude of some of the Pirates is getting fed up. This guy has a "Want to win" attitude,which is a refreshing one in Pittsburgh and the Pirates need more of Ian Snell's type not less. But it is becomingly increasingly clear to me that Captain Dave does not consider Snell his type of player,which makes sense to me. After all,.he is a high quality pitcher and he wants to win badly,cannot have too many of "those"
However,Snell allowed 6 runs in 4 innings last night and did not seem to have his best stuff,although his defense was a hindrance. Jason Bay's miscue due to either lack of hustle or miscommunication with Xavier Nady caused one hit,Ronny Paulino gave another half assed effort to allow a runner to move up and Matt Kata (WHY is he playing anyway) allowed a routine grounder to go through his legs. None of those were Snell's fault,but seemingly frustrated by all this,he allowed a homer to Mets Pitcher (?) John Maine and the game was out of control. Jason Bay did have a nice night with the bat with 2 homers (14 and 15) and 3 RBI. Hopefully,this is the start of a solid second half for Bay. Xavier Nady was the owner of the other RBI. Shane Youman likely pitched the game of his life and what did it get h im? A loss,as the Astros scraped by the Buccos in Pittsburgh 1-0. Youman now 2-2,pitched 8 innings,allowing just 4 hits and 1 run on short rest,pitched far better than any Pirate fan could have expected. But it was not enough as an anemic offense could not score even 1 run against the Astros Woody Williams. The link to the game has Jim Tracy "as beaten down as he has been all season". Well,when you send a lineup out there that has at least 4 almost automatic outs,it makes it tough to beat anyone. Imagine how "beaten down" we are watching this! 1 extra base hit!? And it belongs to Matt Kata???? To hell with Jim Tracy,I am the one that is beaten down!! To watch a performance like this from Shane Youman,who is not the new Sandy Koufax and watch it go for nothing makes me furious beyond belief. I,for one, better have more than just the game in mind. Some Pirates sites rag on the people that go to the games just for the giveaways and I see their point. However,without some of that stuff,many would not go. Imagine paying 25-45 bucks for tickets,10 bucks to park,souvenirs,food,gas etc and your left side of the infield is Matt Kata and Cesar Izturis??? I have stated long before this blog that I think Pirates fans would support a loser,if their team was obviously young and building,like the Marlins seem to do every few years. But this team is NOT young,the starting pitchers are,but the lineup is filled with players ranging from above average (Bay and Sanchez) to average (LaRoche and Nady) to below average (Izturis and Paulino) to AAA level (Kata). THAT is the legacy of failure that Dave Littlefield has "built" in Steeltown. But the Pirates are on the right track. At least Nickels Nutting and Captain Dave think so,I bet Jim Tracy is not quite as sure as he was a week ago. Maybe they can avoid a loss here. The death of Tulsa (Rockies AA) coach Mike Coolbaugh from being struck by a foul line drive to the head as he stood in the coaches box should lead to coaches wearing helmets at all levels. It only makes sense as coaches in the box are the only persons in field without any protection at all. Fielders have gloves,batters have bats and helmets,umpires have padding. Don't be surprised if base umpires begin to wear them too. This is a common sense issue and I feel foolish for not having thought about this before. The Post-Gazette reports that the Captain asked for Troy Glaus for Jack Wilson. Of course,this is another in a line of several ridiculous requests by Littlefield. But assume that that Toronto was dumb enough to take that offer (Littlefield is dumb enough,but that is besides the point). 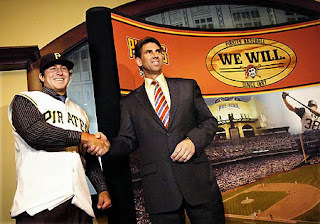 Glaus wants to play in the West and has a complete No-Trade clause,why on earth would he want to be a Pirate? Hickory defeated the Hagerstown Suns yesterday 6-4. Good news on two fronts-the Crawdads won and didn't rough up Erik Arnesen. Erik pitched two scoreless innings. The Cleveland Browns open camp today and all three of their high picks are unsigned. Joe Thomas and Eric Wright are particular concerns. Because they are expected to start at the two toughest positions for a rookie-offensive tackle and cornerback. The more time in camp,the better chance they have to have an impact in year one. 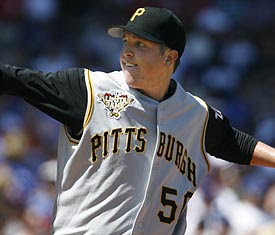 The Pittsburgh Pirates finally won their first game of the second half with a 7-3 win over the Astros in Pittsburgh. Paul Maholm continued his run of reasonably effective pitching as he allowed just 2 runs over 6 and 2/3rds innings on his way to improving his record to 6-12. 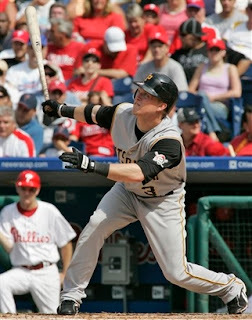 The expected big Bucco bats,Jason Bay and Adam LaRoche each had 2 RBI. Freddy Sanchez hit a solo homer in the 7th inning(5th) off Matt Albers ,while Xavier Nady and Matt Kata(?) added the other Pirate RBI. 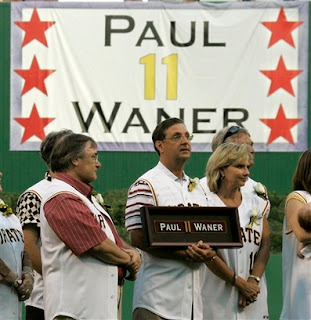 The Pirates organization corrected a long time disservice as the team finally retired the uniform number of Hall of Famer Paul Waner. This should have been done years ago,but credit is due for finally getting this done. Lloyd Waner's number up at PNC Park as well! Series concludes today at 1;35. In watching the Pirates game last night and the Paul Waner ceremonies,Ryan and I we re bemoaning the lack of good nicknames anymore. No originality at all,certainly no "Big Poison" and "Little Poison"s for sure. My theory on this is the newspapers as recently as 30 years,most big league cities had multiple newspapers battling for headlines and a lot of nicknames came as a result of that. Other than New York and Chicago,most cities have just one daily or if they do have two,there is clear dominance by 1. An example is in Washington,where I bet the Post throws away more papers than the Times sells! 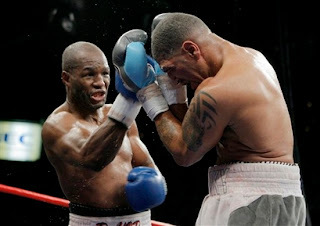 Sorry,I didn't make a pick on the Bernard Hopkins-Winky Wright fight,guess it slipped my mind. Hopkins got a unanimous nod. In the Post Gazette,Speculation on Jack Wilson starts in Toronto and states the Mets have Jose Castillo in their sights. I would love to the Bucs try to land former Hagerstown Suns Bobby Parnell or Jon Niese. One can only hope,more likely the Captain has a target on a relief pitcher at New Orleans (Mets AAA). Speaking of the Captain,why has the newest "Improvement to our team" Cesar Izturis not played yet? If Matt Kata is better than him,why bother to acquire Izturis. Big picture-does not matter neither are worth starting in my opinion,so you can pick your poison. Here is a interesting article from the Cleveland Plain Dealer on Reds 2nd sacker Brandon Phillips. Phillips was given up on by manager Eric Wedge for some unknown reason and has developed into a star in Cincinnati. Respected SI writer Peter King ranks the Browns at 32nd of the NFL's 32 teams. If this turns out to be the case and Brady Quinn is a bust (which I think will be the case) and Dallas picks first overall with the Browns pick-Messrs Crennel and Savage will be going Greyhound about 30 minutes after the last game. King ranks our NFC team in Seattle 9th of the 32 teams. The Pirates wasted a excellent outing from Tom Gorzelanny and lost their seventh game in a row to the Houston Astros and their ace Roy Oswalt 2-1. Carlos Lee's two run homer in the first gave the Astros all the runs that they would need,although Gorzelanny's efforts over the rest of the game kept the Pirates with a chance to win. Gorzelanny falls to 9-5 with the tough luck loss. Jason Bay's 4th inning single scored Freddy Sanchez for the Pirates only run. 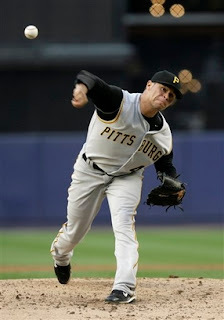 New Pirate Cesar Izturis did not make his debut as expected,instead Matt Kata played 3rd base. Izturis is expected to get the majority of playing time at 3rd for the injured Jose Bautista and then slide over to short,if Jack Wilson gets dealt away. Tonight's lineup was a pretty weak looking one to face one of the best starters in the game. McLouth,Kata,Paulino,Wilson and the pitcher is 5 pretty easy outs to face. 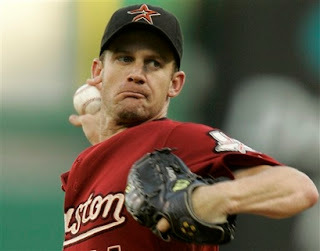 That lineup wont beat average hurlers too often let alone a pitcher of the caliber of Roy Oswalt. The Bucs will try to snap the streak again tomorrow night vs the Astros. The Hagerstown Suns used two late inning homers from Leonard Davis to break open a 1-1 game after 6 and a half to defeat Lexington 7-1. Our favorite Sun Erik Arnesen pitched the seventh and earned his 4th victory of the year. Talked to Erik at the end of the game to offer congratulations as he signed Rachel's hat. Always nice to see good guys succeed. Hagerstown avoided a sweep of the 4 game series with the win and they now go on a ten game road trip,that starts in Hickory, before returning home on the 30th to tackle visiting Augusta. The Hamilton Tiger-Cats hung tough at BC Place vs the Lions last night,but fell sho rt and lost 22-18. The Cats sent Lion 2nd string QB Buck Pierce from the game in the 3rd quarter,but Jarious Jackson was able to led the Lions to the eventual game winning scores. Jason Maas went the distance at QB and played fairly well,throwing a td and a interception,but the star for the Tabbies was running back Jesse Lumsden,who ran for 158 yards and added another 68 yds in receiving. The Cats next game is in Winnipeg vs the Blue Bombers on the 27th. The Pirates picked up utility infielder Cesar Izturis from the Chicago Cubs today for a player to be named later. Butler PA native (and Battlin Bob favorite) Don Kelly was designated for assignment for the second time this season. The Pirates also received an undisclosed amount of cash in the deal. Wow,I am so amazed that cash entered into any Pirate maneuvers! First off,I would figure this-If the Cubs are giving cash,they will be getting a better prospect for Izturis than you think. I hope that this is not the case,but honestly,how many top prospects do the Bucs have? If it is not McCutchen,Walker or maybe Pearce,it should not be anyone too high on any prospect list. So I would tend to think it will be a reliever likely that is at Indianapolis right now,but maybe Altoona,but a starter from the lower levels is a slight possibility. Josh Sharpless,with Bayliss having the edge since Sharpless is a local guy and the Pirates love that sort of thing. Now to the obvious lead-in to whether this leads to the trading of Jac k Wilson. Yeah,I think so and even though I promoted trading Wilson,I have the feeling this is going to result in a bad deal. Considering the altercation between Wilson and pitching coach Jim Colborn recently, I would say this-Jim Tracy had a talk with Dave Littlefield and more or less discussed the following. 1)Jack Wilson apparently is having problems getting along with the coaching staff. 2)Jack Wilson is not a good enough player to put up with these types of problems every day. 3)Cesar Izturis is a Jim Tracy favorite from their days with the Dodgers,is available and would not come at a huge cost. 4)Pittsburgh would save a LOT of money when you look at the contracts of the two players. 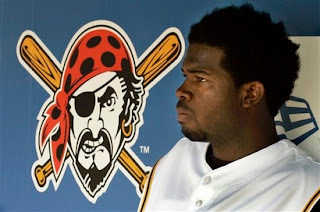 For a look at the contract situation on the Pirates at Cot's Baseball Contracts. Great site for looking at salary numbers! Here is why I have a bad feeling about a Wilson trade. I can hear you all now,"but Shawn ,wasn't it just 1 week ago,where you said trading Jack Wilson was the 1st thing you would do as GM as a short term improvement?? Yes and I stand by it,but that was having faith in what I could get back,I have little faith in what the Captain can get for him and by obtaining Izturis now,he has likely lowered Wilson's value as other (smarter) GM's now know that Littlefield almost HAS to deal Wilson,public statements to the contrary. So in short,Should Jack Wilson go? Will the Pirates get much for him? Doubtful and the likelihood of getting a decent return dwindles by the minute. What does Cesar Izturis bring to the Pirates as the regular shortstop? A similar glove to Wilson,with a lesser bat,but is faster and will steal more bases. And most important,he is cheaper and his salary comes off the books at seasons end. Never underestimate the dollar with the Pittsburgh Pirates. Nickels Nutting did a interview with the Tribune-Review and made me laugh and cry at the same time. Quote of the day from Nickels-"The farm system and development staff have shown very positive signs that we're doing not just a good job, but in many respects, a great job." What makes you think that in ANY way? Because Indianapolis and Altoona are each two games over .500? The massive amount of prospects that are ready to go? The same amount of prospects that could be reasonably decent trade bait? Please,how deluded can you be??? Saw tonight's Lexington-Hagerstown game,which was a 3-1 Lexington win in 11 innings. Sharp outing for Lexington lefty Polin Trinidad,7 innings,1 run and only 2 hits,as well as a good outing for nice guy veteran Don Levinski. Levinski threw 6 shutout innings for the Suns. Plus,got to see reader Chet Trybus at the game tonight. Always a pleasure to talk some Bucco baseball with Chet. Thirsty Thursday or as I like to call it Drunkard night. Security on the other hand,not in effect as a few of these "fans" wandered into areas that they were not allowed to be in,acted like obnoxious idiots and no one said a word. The Suns management only seems to be worried about the money that these nights bring in,not the money that these nights drive away from people that just don't want to put up with it. The so-called "suite area" ban for the autograph collectors continues to be enforced only when GM Will Smith sees fit. Tonight the area had several fans in it,Smith walked right by twice and never said a word. Which is fine by me,the ban is silly to begin with. But he picks and chooses on when to enforce this issue,Monday,he ran a bunch of fans out that did not have "suite tickets". It is a silly thing to begin with,as I now stay out of the area,so I don't have to listen to any unneeded verbiage from the Suns employees,but for the Suns only to complain when someone feels like it is cheesy at best and dumb at worst. Suns manager Tommy Herr continues to ignore autograph requests at Municipal Stadium,but is reported to be a willing signer on the road. I don't know what the reason for that would be,but one would think it would be the other way around. Herr came to Hagerstown with a reputation as a willing signer,but has proven to be a disappointment thus far. I will be doing a "3 months later" entry on the Suns,their problems and even more things they are blundering on soon. The Phillies signed their first rounder,Rice pitcher Joe Savery. The Phils assigned him to Williamsport (NY-Penn). I am hoping for a late season promotion to Lakewood as the Blue Claws still have a visit here before seasons end. I also added a small part to part 2 of the Pirates GM series that I wanted to address,but forgot to. The Hamilton Tiger-Cats are currently playing the BC Lions close in Vancouver. More on that later today or tomorrow! Pirates lose 6th in a row and we catch up on things. To begin,I would like to thank all of you that posted,instant messaged,emailed and talked to me last night and this afternoon to offer your condolences on Chancellor's passing. On behalf of myself,Cherie,Ryan and Rachel-Thank you all for your kind words. They have been greatly appreciated by all of us. Now back to catching up. The last I posted ,the Pirates had lost their first game back since the All-Star break. Since then,that losing streak has extended to 6 and the ridiculous talk of a .500 season or rallying for a divisional run is now history. I thought it was a fantasy at best,but sometimes one can dream. But in one week it is all extinguished. After dropping 3 games to the Braves at Turner Field,the Buccos returned home to drop 3 more to the Rockies. Today's 5-3 loss had some controversy as Ian Snell accused the Rockies of sign stealing. I am not sure how much I believe that,but the game was not televised,so I cannot say that I know. But Snell,now 7-7, is one of the few on this team that actually seems to care,so I will back him on this one. Ian Snell is the type of fiery player that this team needs more of and I will take any little bit of fire and concern on the Pirates that I can get,even if it could be misguided. The Bucs did have two homers in the game from Adam LaRoche (14th) and Freddy Sanchez (4th). In my opinion,Jim Tracy has lost his ball club. He has his best player in a miserable slump (Jason Bay),his pitching coach arguing with position players (a new one to me),a losing streak filled with uninspired play and after a meeting with his "team Leaders" that included B.P.Chacon!? resulted in another poor effort.what else can I say? Show me one thing that would make you think that Jim Tracy can turn this around. I do not see it in any way. From effort to morale to games won,I see no hope under this regime. However,I am not sure if anyone changes things from the outside either. Think about this-Who is available that changes things that can take the team over in mid-season? Joe Girardi?He turned down Baltimore,who will spend far more than the Bucs,why would he take this team? Dusty Baker? I like Dusty a lot,but he is a better manager with a veteran,contending team,than any other types,look at his lack of success in Chicago. So,sadly,as much as I think Tracy is a failure,I see no alternative that will improve this team. If you want to fire him and give it to a coach to run the season out and hope things change,be my guest,but I don't believe it changes the won-loss record all that much. Today's Pirate notebook in the Post Gazette has a few belly laughs. Captain Dave has no worries about his future. (Oh boy) and since he is not worried,he is starting talks to extend B.P. Chacon's contract. (Double Oh Boy). So IF the Captain gets the axe over the winter,he gets a bit of revenge on the new hire by saddling him with B.P.Chacon's new long term contract. Now the Captain-We can fire ANYTIME!!!!!!!!!! The Pirates did sign Daniel Moskos and are sending him to Bradenton. Good news? He may go to Hickory after that,so I might see him pitch and get a card signed. Anyone out there outside of Don Kelly's family or fellow Butler Pa native Battlin Bob excited about his return to Pittsburgh. During Hiatus-I did get to see the Hamilton Tiger-Cats game vs Montreal. They not only scored some touchdowns,they rallied to make the Alouettes sweat a bit before succumbing 29-20. Timmy Chang came off the bench to fire a TD pass to Brock Ralph and moved the Cats down the field for a follow-up field goal to get within 6 points. No word on whether Chang or Jason Maas will start in this weeks expected blood letting at the 3-0 and defending Grey Cup Champion BC Lions at Vancouver. The Cats wore these new Yellow jerseys. Not bad,but I will take the traditional Black. Makes them easier to see! Was at tonight's Hagerstown Suns-Lexington Legends game,which was won by Lexington 6-4 in 10 innings. Very impressed by Lexington lefty starter David Qualben. Qualben throws around 90 and has a deadly pickoff move,tonight he picked off 3 runners and had Koby Clemens not dropped a throw,would have had a 4th. Keep an eye on David Qualben for those of you in Fantasy leagues that have minor leaguers. I missed two of the 3 Lake County games.If that does not tell you about the issues around this house,nothing does,as I miss a Hickory or Lake County visit only when I HAVE to. Any way I only needed 2 Lake County guys and got them both. Paolo Espino and Carlton Smith were both able to sign cards, Espino for me and Smith for Ryan and the visiting (and new reader) Jeff Boone. Thanks to both for the help. Have gotten all the Lexington players in their team set,except for one. I do not expect to get Jhon Florentino,as his signing hand is in a cast. Oh,well maybe next year at Salem. A very good signing team for the most part,with a star given to outfielder Drew Holder and Tallmadge Ohio's Brandon Caipen. I talked to Brandon for a few minutes about Tallmadge,very nice guy. Tallmadge always has a place (although not a special one) in mine and Cherie's life for an event that happened 20 years ago. Maybe I will write about that on a slow day. Wonder if one of our readers,Becky,remembers that event in Tallmadge??? So,only one guy to get over the next two games-the newest Sun-catcher John Poppert. The Suns will be on the road after that until July 30th,when they take on the Augusta Greenjackets. Augusta is a Giants farm team. Welcome to two new readers-the aforementioned Jeff Boone and Bill Cover. Both are great guys and I have gotten to know them through autograph collecting at different games. I think that catches us up a bit. Dont forget to vote in the football poll,close voting thus far!!!!! One more thing,Bob,you have anything to add on the Pirates??? Sorry for my absence and this departure from the usual format. We lost a member of the family today. Chancellor passed away today after a short illness. He was a loved member of our family and we all will miss him dearly. To be fair,although Chancellor was a family dog,he really belonged to one person-Ryan. There was a connection between the two of them that was fun to see. Chancellor came to us five years ago with several handicaps and as time went on,his hearing and vision,which were limited when he arrived had worsened as time went on. He passed at the Veterinary Hospital this afternoon and I think in his own way,Chancellor gave us one final gift. He allowed us to avoid making the difficult decision of whether or not to end his life. Chancellor had a good quality of life though,as Ryan and his running buddy Teddy helped him get around very well until the last 5 days of his life. He was a quiet and unassuming friend to us all and he will be dearly missed. I know that some think they are just animals and all,but they become part of the family and the one thing that a dog and to a lesser degree-a cat gives is unconditional love. After all,how many of us get that from our fellow man? The scary thing for me is this-if I am this upset over Chancellor,how will I handle the loss of Teddy,who I do have a deep connection with? That is a day that I greatly fear. I would like to thank a few people involved with this sad day. The staff at Park Circle Animal Hospital were kind,caring and professional. From the nurses to Dr.Benjamin Byers,all did wonderful work with Chancellor and I would recommend them highly,although I cannot say the same for the weekend "on call" vet,but that is another story for another day. I would like to thank all the people that have been there for us over the last few days. Mike McKain along with Joe and Autumn Plum were available for our family all night Saturday and Sunday,when I was at work and if Chancellor needed emergency care,they were there for us. I would also like to thank the various people that have called today,but especially my dad. His call was unexpected yet appreciated so much. He likely doesn't even know this blog exists,but he will never know how much his call meant to me today. Finally,Thanks to Chancellor for allowing us to bring him into our home and share his life with us. I hope we made his time here as happy as he made ours. I will be back tomorrow with the usual format with the nastiness and caustic wit that you all expect. I wouldn't want you guys to think I am getting soft! Due to some personal issues,I have not been posting this weekend. I will be back full force either Monday or Tuesday. An Adam LaRoche error led to a three run homer by Atlanta's Brian McCa nn in the 1st inning and it rolled downhill from there,as the Pirates returned from the all star break with a 9-1 loss to the Braves at Turner Field. The 1st inning runs off Ian Snell were unearned ,but the 6th inning runs that chased Snell from the game were not. Snell allowed two more homers before being lifted in the 6th. Snell falls to 7-6 with the loss. Ian just did not seem sharp,perhaps the layoff was more of a hindrance than a help. Ronny Paulino's 9th inning double that scored Jason Bay was the Buccos only run. The Indians used a ninth inning single by Ryan Garko to win over the Royals 5-4. Joe Borowski was the winner despite allowing KC to tie the game on his watch. The Hamilton Tiger-Cats attempt to score their 1st touchdown and win th eir first game tonight in Hamilton vs the Montreal Alouettes. Both teams enter the game 0-2. Jason Maas is again expected to start at quarterback for the Tabbies. I will be watching the game live ,unless I decide to go to the Suns-Captains game tonight,then I will watch at work on tape. In another CFL related note-reader Joe Pritchard writes a column at CFL Insider. Take a look at "Joe's Take". I just wish the Cats would do something positive for Joe to write about! Looks like a good boxing triple-header tonight on HBO. In the most important fight of the 3,Antonio Margarito defends his fringe belt vs the talented Paul Williams. Margarito has agreed to meet WBA titlist Miguel Cotto with a win over Williams. That would be a terrific action fight,so I am rooting for Margarito for that reason. But I like the style matchup for Williams,so I pick Williams in a upset. IBF Champ Kermit Cintron defends his belt vs Walter Mattstyte and the always exciting Arturo Gatti battles clubfighter Alfonso Gomez. I will pick the favorites in those two fights. A quick edition of Random Ramblings to catch up on items of note since the Pirates GM series. Sorry to hear about the death of Lady Bird Johnson at 95. Those of you that know me well already know that Lyndon Johnson is one of my top 3 favorite Presidents (Really). Her work on Conservation and highway beautification,in many ways,served as the beginning of our nation's commitment to matters of naturalization. Seemed like a terrific lady and served as the type of First Lady that the country could be proud to have as a Representative. Interesting choice by the New Jersey Devils is hiring Brent Sutter as head coach. It is the first NHL coaching job for Sutter,but his brothers all did well in coaching,so here is hoping he does the same. I was impressed by his brother Brian's job in Chicago and Brian led the Hawks to their last playoff appearance. Hey,David Beckham is coming to America! As a "Unenlightened "sports fan (Non-Soccer),I could really care less,not to mention I have no idea who his wife is,but seems like she is a big deal to the media. The United States has been through this before with the "This person is the person that takes soccer over the top" hype. Pele,The women's win in whatever it was,the World Cup hosted here etc. In the end,it all winds up the same,some media flurries of interest and the soccerheads go wild for a while. Then it does what it always does,goes back to no one caring. Might want to keep this one,likely the only note on Soccer you will read here. Added a link to the links list. John Setzler's Crawdad Blog covers the Pirates SAL team in Hickory. Good site with lots of professional photos of the Crawdads. All for now,back tomorrow with Pirates vs Braves! So we have changed the way we select talent in the amateur draft,we have chosen the type of team we want to play as,we are working on installing a teaching effort that is the same from GCL to Pittsburgh,We have installed minor league managers and coaches that fit what we want do and when possible,we try to fill these spots with players from Pirate past. We also have made a few image,merchandising and marketing changes and began to spend more money on the Latin and Asian markets. Well,We start working on future contracts NOW with Ian Snell and Tom Gorzelanny. The past group tried to nickel and dime young players for as long as possible and then wondered why those players stuck it to them in arbitration and then left in free agency. We want the players that we develop to want to stay in Pittsburgh. Well,you never can keep them all with our budget and some will want to chase the bigger contracts elsewhere. But by giving young and productive players fair deals concurrent with their seniority,you build up goodwill. Anyone that deals with others respectfully and honestly will have easier dealings down the road than someone that puts the screws to you when they hold the cards. So we are opening talks with Snell and Gorzelanny ASAP and attempt to give them fair contracts for them,that moves arbitration off the table for a few years. Nothing is worse for player-management relations than arbitration. Someone always winds up with hard feelings as far as the loser goes and the player gets to hear himself be belittled by the team that has his rights. These two are the horses of our future rotation,lets try to make moves to keep them happy and maybe you have a chance of keeping one down the road. We will be in the race for the top Japanese players at position of need. On this team-that projects as 3rd base,unless Neil Walker turns out well and outfield,as I do not think we have a chance to re-sign Jason Bay down the road. Littlefield did to Bay,exactly what I described and wait to avoid above. Ill will,bad feelings and fewer dollars to play with equals good-bye Jason. We also look at the budget and attempt to sign 1 player of these 3 at a fair value -Jason Bay,Adam LaRoche and Freddy Sanchez. I do not think Bay would accept and LaRoche is not likely either,but Sanchez-Maybe. Making a commitment to one of these players will not be a financial black hole for the team,like past attempts with Pat Meares,Jason Kendall and Jack Wilson. ALL of those players were signed despite questions about them. Meares (health and bad player),Kendall (wore down from catching and little power) and Wilson (average bat,coming off a career year). The player that you sign of the 3 has none of those concerns. This shows commitment to winning and yet you do it with a player worth the money. That has not been the case in similar past attempts. The Pirates will not be afraid to trade and I realize that trading for prospects is yet another Pirate rebuilding program. I know fans are tired of these,but I believe that by laying out in the open an honest program that entails the short and long term,that shows that we have a plan that shows a desire to WIN,not sell tickets. I believe that the Pittsburgh fans will back a young team that is allowed to grow together as a young team,not a mismatched crew of washed up veterans. The goal is to win the division,not dream of .500. Hope you enjoyed it and feel free to comment either here or send me some email. Back to the normal program tomorrow with Random Ramblings on things I did not write about during the series. LaRoche and Doumit blasts lead Buccos to win!